I have a slight obsession with all things tropical in nature. When I was 10 or 11 years old my mom and dad brought me a cassette tape from the Bahamas with some local music. I was hooked, really hooked. I wore that poor tape out. I saw the Caribbean blue waters for the first time in person when I was in jr. high and the obsession just multiplied. I dream about tropical vacations all the time, listen to reggae music more than is normal, and love to make tropical food to remind me of island life. 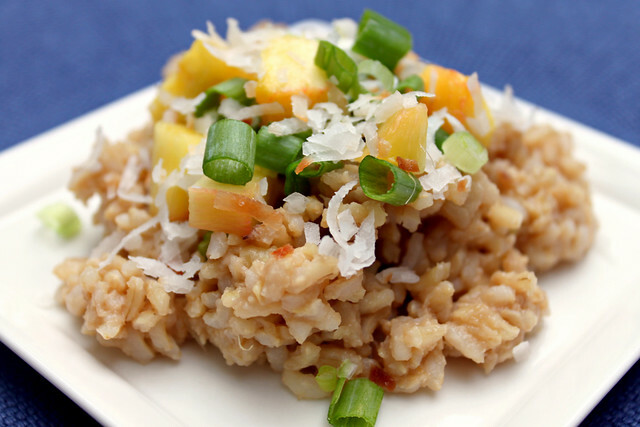 This Tropical Rice is full of beachy flavors and is the perfect accompaniment to fish or chicken. I use brown rice and light coconut milk to keep it healthy. In a medium pot add the rice, coconut milk and broth and bring to a boil over high heat. Once boiling, reduce heat to low and cook covered for 30 minutes. Test the rice and add more liquid if it is still hard. Once the rice is cooked fluff it with a fork. Add the crushed pineapple, soy sauce, sesame oil and brown sugar. Stir with the fork until combined. Serve with toasted coconut and green onions. Thanks for this post. I could have used it a month ago when we had a luau themed dinner! I think it would have gone great with my jamaican jerk pulled pork. I will keep it in mind for next time!